For 2013, G3 Boats of Lebanon, Missouri, a Yamaha Marine Company, offers twenty-five models of Eagle Mod-V and Angler Deep-V fishing boats from fifteen to nineteen feet, plus forty models of Gator Tough Jon boats from fourteen to nineteen feet, plus another nineteen models of regular Jon boats from ten to eighteen feet, plus, hold on, thirty models of SunCatcher pontoon boats from sixteen to over twenty-six feet. If anyone’s counting, that’s a staggering one hundred and fourteen total models of aluminum boats from one company! 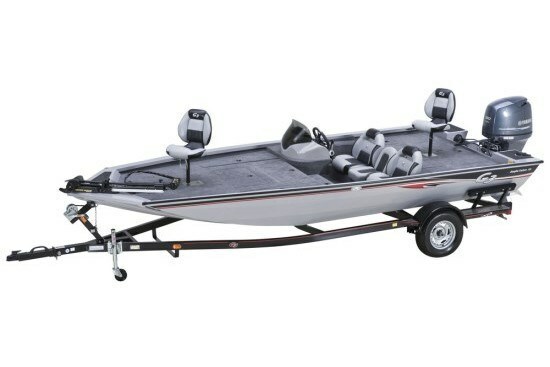 The Eagle Talon 19 DLX subject of this review is the largest and most dressed up of the twelve models in the Eagle Mod-V series of all-welded fishing boats ranging from fifteen feet to this nineteen footer. Referring specifically to the two Talon models in the Eagle series (seventeen and nineteen feet, each in two trim levels of regular and deluxe – four models in total), G3 says, “The Eagle Talon series of bass boats provides anglers new options in G3 quality and performance. The Talon's all-aluminum construction is enhanced by superior features, including a wide body 92" beam, exceptional lockable storage, 33 gallon livewell, and head-turning graphics. The deluxe model also includes upgraded electronics, 24 volt trolling motor, three bank battery charger and custom mooring cover. Find your edge with the Eagle Talon and feel the satisfaction that comes with the quality of G3 and Yamaha.” The Eagle Talon 19 DLX is of course the “deluxe” model referred to above, and let there be no doubt about the intentions of this boat, it is all bass fishing through and through. In addition to the all-welded, two-piece .100 gauge aluminum hull, it is virtually all-aluminum throughout including not only the full length longitudinal stringer system, but also the floors, decks, transom, and storage area lids. There is also a full length centre keel extrusion. Inside the hull is injected with closed cell hull foam. Carpet covers the interior. The exterior features a baked on, two part urethane finish in your choice of blue or red accenting. The forward casting deck of the Eagle Talon 19 DLX takes up roughly half the interior as is fairly normal on a bass boat and this deck is loaded with not only storage compartments but also lots of features to make your fishing experience rewarding. 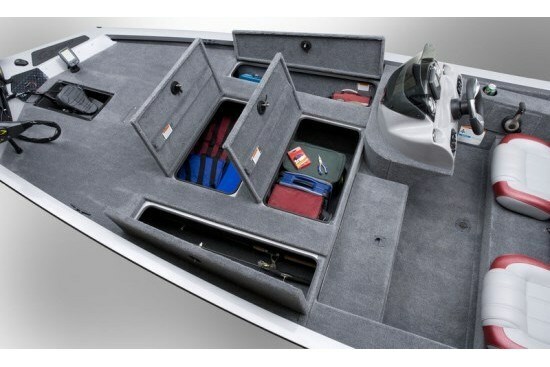 A longitudinal lockable rod locker on each outer side of the deck hold up to nine-foot rods plus some gear and two large dry roto-molded center lockable compartments hold even more gear. A forward swivel pedestal seat has two screw-in base locations one of which will be perfect for your preference of operating the centre forward recessed trolling motor control. The standard trolling motor is a Minn Kota® Maxxum® 70 lb. thrust, 24-volt model. Optionally available is an 80-lb. thrust model. Standard at the bow is a Garmin® echo™ 100 fishfinder to complement the standard console-mounted in-dash model 200 fishfinder. Either or both of these may be optionally upgraded with several choices right up to the model 550C. 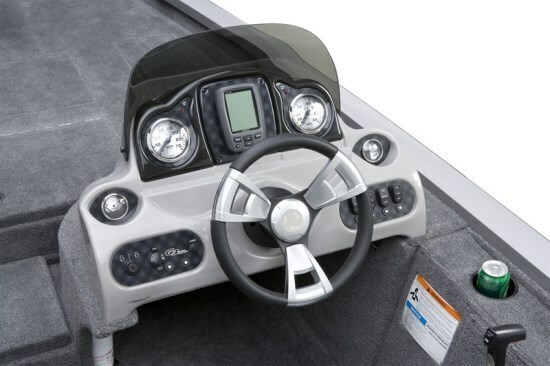 The starboard side console is molded fibreglass with a tinted plexiglass windscreen and comes standard with four fog resistant Faria gauges and hydraulic steering for the standard Yamaha F70 four stroke outboard or three optional choices up to the F150. G3 claims a 52.5 mph top speed with the F150; 47.5 with the F115. 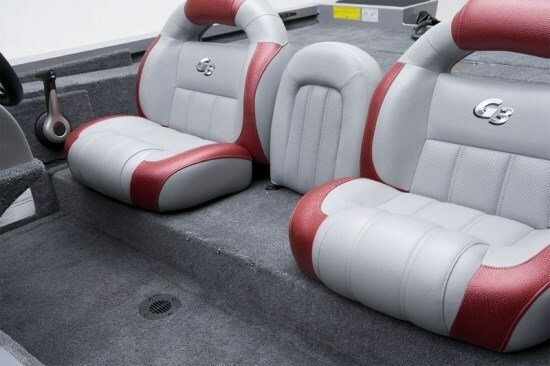 Three-across upholstered seating is provided at the helm with the bottom cushion of the smaller centre seat removable for easier access to the aft casting platform. 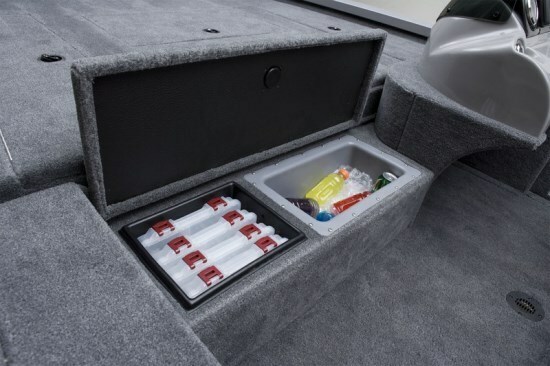 More storage is provided under the two outer helm seats and the step up to the forward platform contains tackle storage trays and an insulated cooler with insulated lid. A second “pinch-less” fold down fishing seat is provided on the aft casting platform along with a 33-gallon divided aerated livewell with fill, recirculation, timer, dump out, and drain plus insulated lid. Also back here is a lockable battery compartment. There are two additional smaller storage compartments here as well. Additional notable standard equipment on the Eagle Talon 19 DLX includes a custom Dowco® “ratchet” style mooring cover, battery charger, three trim locations, and a “should have” fuel separating filter. Also standard is a Trail Guard® custom powder coated trailer with detachable tongue and aluminum wheels and spare tire. It is obvious that this deluxe model Eagle Talon 19 DLX comes complete with virtually everything you need to start catching bass right from the showroom.